Like most people, I thought about meditating well before embarking on a regular meditation practice. On occasion I’d catch myself meditating at the end of a yoga class, and sometimes I’d even choose to sit for five minutes at the start of my day. But for the most part, meditation was an idea, not a practice. “I’m too restless to sit still”, I’d say. “I have no time” was another reason to skip meditation. I’d nod in agreement with others when they’d mention the value of their own sitting practice, but I didn’t plan on making it a priority for myself. That changed for me in September 2016. I had struggled with anxiety on and off my whole life, but I had recently experienced an uptick in its symptoms and effects. Aside from being constantly worried about everything from my subway commute to global politics, I was becoming increasingly absent minded. My lack of presence was often frustrating (I was forever searching for my keys/wallet/phone) and at times dangerous (coming home late at night to find that I’d left the toaster oven on all day). Additionally, I had previously managed to force myself to snap out of it when I’d feel my anxiety building, but I had gotten to the point that no amount of self will could de-escalate my fear. I still didn’t have much interest in meditating, but I knew I had to slow down and was just willing enough to try. I took a few suggestions from friends who meditated daily and committed to sitting for five minutes every morning. At first it was a struggle to make time for meditation, but I was surprised at how comforting it was to let myself be still and to simply focus on my breath. After a few weeks I extended my practice to ten minutes, and before long I was sitting for twenty minutes each morning. I was noticeably less hurried, less reactive and more trusting of myself and others. Despite spending an ample portion of my morning sitting still, I felt as though I had more time and was able to give more attention to the task at hand. I still enjoy the focus and calm that meditation provides, but the most powerful benefit for me is that my anxiety can no longer spiral downward to unmanageable levels. I continue to experience worry and doubt, but it’s as if my daily practice provides soft floor for my fear to rest upon, and I can safely arrive back to the present moment after a few deep breaths. In many ways, I’m the same person I always was, despite over two years of daily meditation. I’m still restless, my mind is unruly, and I still struggle from time to time with catastrophic thinking. What’s different now is that I’m not trying to cure my anxiety or bully myself into being better. Meditation encourages the development of reason, without demanding that the meditator only thinks reasonable thoughts. The effect is that I can tap into greater reservoirs of compassion and courage when I feel fear, and that I can extend that compassion and courage outward to others. Although anxiety is common, you don’t have to struggle with anxiety to benefit from meditation. Life is more vibrant when you’re present and aware, and mediation is a great tool for helping us maintain presence. Remember, you don’t have to be great at meditating to experience the benefits, and there is no better time than the present to get started. This month at 2nd Story, we are devoting a few moments of each class to stillness. Additionally, we are continuing with a $5 Intro to Meditation class with the wonderful Patrick Paul Garlinger. 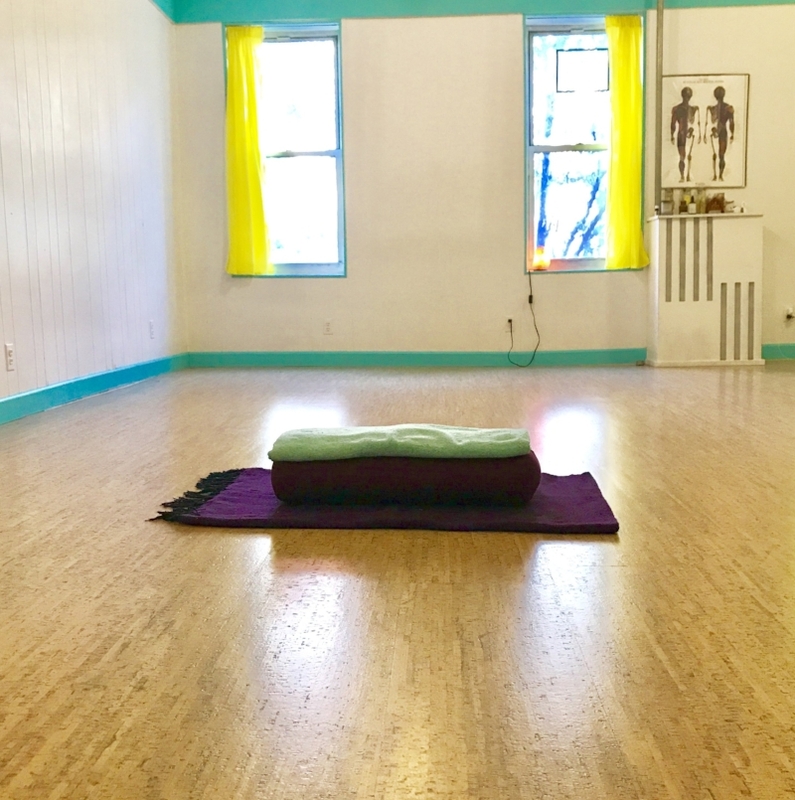 His classes are offered in both English and Spanish and are a great way to jumpstart a meditation practice. Check the schedule for his class on November 18th and enjoy some extra stillness this month. Thanks always for your presence at 2nd Story! Joseph Pilates, the inventor of Pilates training invented his first “apparatus” during WWI, where he attached springs to hospital beds so that bedridden patients could still exercise against resistance. Many don’t know that the Pilates Equipment exercises were invented before the Mat work. When he moved to New York in 1926 he met his wife Clara, and they opened a studio, sharing the same address with the New York City Ballet! He called his methodology Contrology (core, control, post war… makes sense). Most of Joseph Pilate’s students consisted of dancers once he moved to the New York city area, and it was through them that the work evolved to what it is today. That is why you may see Classical Pilates (Joseph) and Contemporary (the evolution). Last Thursday I went to MOMA to see the exhibition, Judson Dance Theatre: the Work is Never Done. After seeing a live performance of Yvonne Rainer’s dances from the late 60s, I was overwhelmed by the playfulness of those works. During the show Yvonne (now 83) joined the dancers in MOMA’s second floor atrium turned performance space. She talked about this choice after the show, and casually said how she could still run and walk, so why not still participate in those aspects of the piece, and also be honest in exposing the movements that she can no longer do. That was the exactly Judson Spirit in its formative years of experimentation , to “lay it all out on the table.”. The very idea of exposing creative process is what struck my heart. The piece was made, and was being remade again in the moment. This past summer at Jacob’s Pillow (a dance school and festival in Massachusetts) I spent hours watching Joseph Pilates footage from the 1940s and 50s. Not only was I reacquainting myself with the origin of Pilates but I was struck by the vigor and inventiveness of Joseph himself. He courted an air of experimentation throughout all of the archival footage that I witnessed . There were videos not only of Joseph teaching his students at Jacobs Pillow, but at his studio in New York. Dancers holding clip boards and wearing little shorts and tops practicing on what is called the chair. Hooks on barn door walls, pulling out against springs hanging from wherever. Or in his apartment, with his wife, who was sitting on what looked like a normal chair, until he flips it over, adds springs to it and starts to exercise. Movement was always in play and always in Process. I think about these spirits as I sense what Pilates has done for me as a dancer. I heard many dancers speaking about a movement home. A modality that they could always return to as they experimented with other forms. These wonderful pieces of Pilates Equipment became a home for me along with the Pilates Mat choreography and principles. Both forms complimenting one another, but offering very different sensations. I could run with these on my own and always return to them for further learning and inspiration…… thus birthed 2nd Story. What I am practicing as a student and as a teacher feels like mindful conditioning. Where is your breath? Where are your bones aligning today? How does this movement work? What am I doing within the movement? Questions that I will probably be asking and learning about for the rest of my days. I feel stronger because every day I am learning what my body likes to do or not do. Whether Pilates or Yoga, I invite you all to play, to inquire, to revisit and remake in the moment because every day, every decade feels different.